The hum and rhythm of cicadas is a noise that used to bother me when I was a kid, but now is such a part of autumn life that I kind of miss it if it’s not there in the evenings. However, while the sound of these aural insects is not hard to miss it’s the bugs themselves which can sometimes be a bit more elusive. 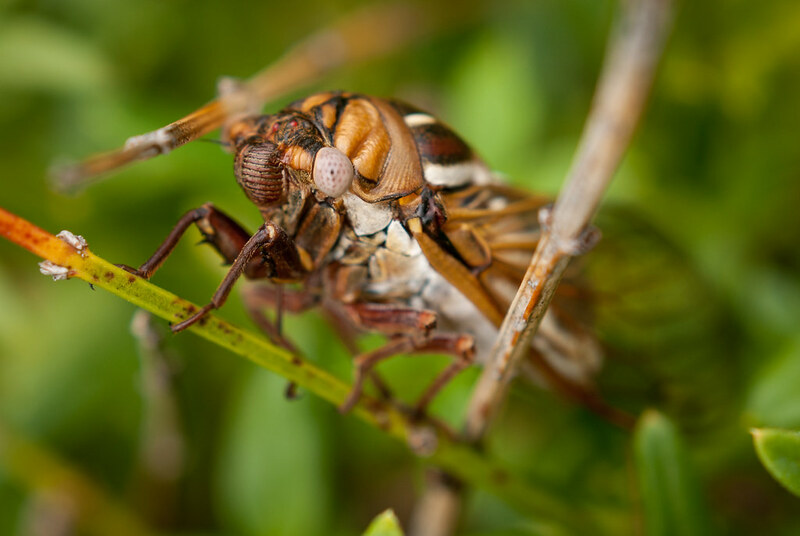 It’s not uncommon to find evidence of their presence on trees, bushes, and the sides of buildings but for some reason I don’t actually see the cicadas themselves very often if ever. It was because of this that I didn’t really think much of the subject of this photo when I walked past a bush across the street from my building at OSU, and almost missed a good photo opportunity in the process. When I saw this little guy hanging out in the late afternoon sunshine I thought it was just another outer shell but, because it was so large, I thought I might as well take a picture of it anyway. When I got back to my office I grabbed my D200, 50mm lens, and set of close-up filters and walked back across the street (along with two friends from my office who just happened to be going in the same direction) to snap a photo or two. As soon as we got to the cicada shell one of them pointed out that it was, in fact, not a shell at all but a living cicada still very much ensconced in his existing exoskeleton. Thankfully this cicada wasn’t too interested in moving around, and didn’t seem to mind that I was shoving a giant camera in his face, so I was able to spend a few minutes moving around and changing close-up filters to get just the shot I was looking for. I initially shot with my +10 filter at f/8 (and ISO 200, all the while being thankful for good light since the D200 is pretty bad at ISO 800 or higher) and got some shots that, while kind of neat, were honestly just a bit too close to be interesting. Soon I switched to my +4 filter at f/4 and took several shots like the one you see here, but from different angles and knowing I would likely need to crop in a bit. While I was photographing I started to get a little frustrated with one of the limitations of this old camera, in that there are only 11 autofocus points. I really wanted to nail focus on the eye, but focus-and-recompose is out of the question when working at such close distances because the depth of field is so shallow. If I was using my D7100 or D750 I could have just selected an AF point that was right on top of the eye but on my D200 when I did that same thing it invariably resulted in a poor overall composition which was why the ending shot needed to be cropped a bit more than I would have liked. In the end I was thrilled to get to see a cicada up close and get a decent shot of it too. As my wife said, “that bug has one ugly mug!” and I certainly agree with that assessment. If one landed on me I’d probably freak out and shoo it away as quickly as possible, but it was fun to spend a few minutes getting a close look at such a fascinatingly-designed insect. Reminds me of Alien versus Predator! Oh man, I never thought about that before. And now this photo is going to give me nightmares! Their noises used to keep me up when I was a kid but now I kind of like hearing the hum of cicadas in the evening. There’s something weirdly comforting about it. Recently while walking the dogs I heard a constant hum or buzzing that sounded like an electrical malfunction. It turned out that one of the dogs had captured a cicada in its mouth, but wasn’t quite sure what to do with it. Eventually the dog released the cicada, which stopped the sound. When I realized what had happened, I was surprised to see the live cicada, stunned, but still intact.